Dade Telecommunications technicians specialize in Avaya (formerly Lucent) communications systems. Avaya Partner ACS Communications and Voice Mail Systems: The Partner ACS is a small-business workhorse. If you have had trouble finding trained technicians to service your Partner system, look no further, as Dade Telecommunications Inc. can handle your requests. To find out whether this system is right for your company, small office or home environment, please contact us. The Partner ACS supports many varieties of voicemail options. From the external Partner Mail to the older inboard Partner Mail VS through to the current release of the Partner Messaging module, Dade Telecommunications Inc.'s technicians have the knowledge and experience you need to keep your systems running efficiently. 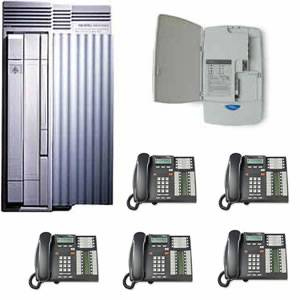 Nortel Norstar T7208 and T7316 telephones are Dade Telecommunications best-selling product! The T7316 phone is perfect for supervisors, managers, executives and other business professionals. Norstar business phones work with all Nortel Norstar telephone systems (CICS, MICS and BCM). Nortel Business Series Terminals T7316 is a full-featured, expandable, multi-line telephone that has a two-line, 16-character-per-line display that is menu driven and supported by three context-sensitive soft keys. The Norstar T7316 provides access to 24 memory buttons, 16 of which include multi-segment icons for fast and precise decision making. It is designed for high call volume positions requiring access to extensive system features. Norstar T7316 telephones are designed with you in mind.